Disabled people and their organisations have branded this week’s budget misguided and cruel, and say it will drag many more disabled people into poverty. Their chief target was the chancellor’s decision to remove – from April 2017 – the extra financial support given to new claimants in the work-related activity group (WRAG) of employment and support allowance (ESA), the out-of-work disability benefit. But there were also warnings of the impact on disabled people of freezing until 2020 most working-age benefits, although not disability living allowance (DLA) or personal independence payment (PIP). Another concern was over cutting the benefit cap from £26,000 to £20,000 a year for those outside London, and to £23,000 for those in the capital, although this again will not apply to those claiming PIP or DLA. Sayce pointed to the decision to scrap the extra support given to disabled people in the WRAG – which at current rates would see weekly payments fall from about £102 a week to £73 – which she said was “a bitter blow”. She said: “Many disabled people want to work. Becoming disabled through an accident, or getting cancer, or some other condition, can happen to anyone. Sayce also pointed out that many disabled people would be hit by the decision to lower the benefit cap. 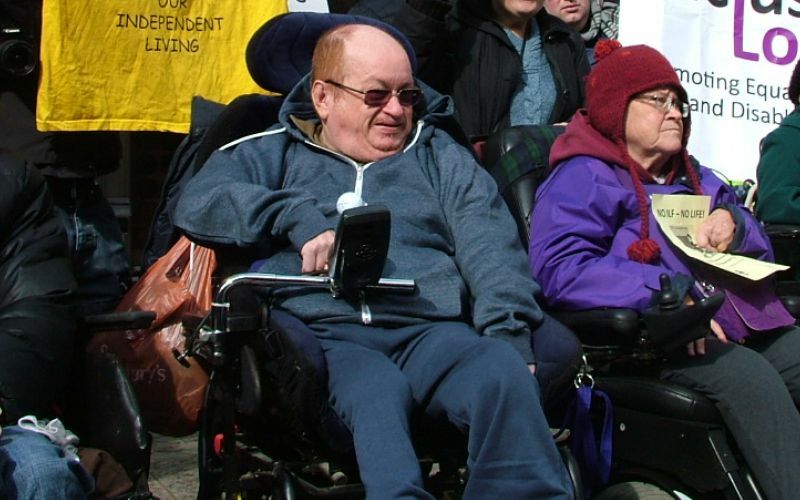 Robert Punton (pictured), a member of Disabled People Against Cuts, who took part in a protest against the budget in Westminster yesterday, said Osborne had launched an attack on the social model of disability. Peter Beresford, co-chair of the national service-user network Shaping Our Lives and professor of social policy at Brunel University, said: “The budget offers nothing positive and more problems for disabled people if they are in employment or seeking it or need the support of benefits. But he suggested that the budget “may have the opposite effect to that intended”, as “more and more groups, individuals and families, young and older, are brought into the orbit of welfare reform”. Laura Stringhetti, of the WOWcampaign, said: “Lowering the weekly amount people receive when in the WRAG, which would be the same as claimants receive when on JSA, will have a profound, negative impact on many people. “The amount of money JSA pays is enough to survive on a short-term basis; it is not enough to allow an adequate standard of living to people who might be unable, through no fault of their own, to find employment in a labour market often not prepared to employ chronically-ill and disabled people. John McArdle, co-founder of Black Triangle, said the WRAG cut was “a barbaric act”. He said: “Arbitrarily cutting £30 per week from sick and/or disabled people who, in a vast number of cases, have wrongly been found to have limited capability for work under the bogus work capability assessment regime – and so placed in the WRAG group with statistically no real hope of finding work and every chance of ending up destitute at food banks for failure to comply with conditionality – is an utterly despicable act of cruelty. “Many will end up on the streets, or worse. Pat Onions, founder of Pat’s Petition, said Osborne had demonstrated the “total confusion” within the government about the nature of the WRAG. She said: “People are put in the WRAG because they are tested by the work capability assessment (WCA) and judged currently not to be able to work. “But once they are in the WRAG this result is ignored and they are treated as if their condition has miraculously improved and they can now get a job. She added: “The logic of the test says that most people in the WRAG cannot get jobs. All the evidence shows that most people in the WRAG are not getting jobs. Meanwhile, the Institute for Fiscal Studies – whose work is often quoted by ministers – said that Osborne’s WRAG move would strengthen a disabled person’s incentive to be placed in the ESA support group, where claimants are not required to carry out any work-related activity at all. The reaction to the budget on social media among disabled campaigners was equally critical. The disabled activist and blogger Steve Sumpter, who tweets at @latentexistence, said: “I’m currently in the ESA support group, and get DLA high-rate mobility. In theory I’m one of the vulnerable people Tories claim to protect. He said that almost three-fifths of people on jobseeker’s allowance move off the benefit within six months, whereas nearly three-fifths of people in the WRAG need that support for at least two years. He said: “It is unrealistic to expect people to survive on £73 a week for this length of time. He added: “It is insulting and misguided to imply that ill and disabled people on ESA will be more likely to move into work if their benefits are cut.